Hi to all of you, and welcome to this blog about management, projects, IT, etc. and about life among all of that. I'd like to share my thoughts, knowledges, experiences and to propose them for discussions. What does a business need first in order to begin growing? Any business development starts with process organization. Before starting a new business or expanding an existing business, we need to have clearly defined processes and a clear understanding of these processes. If we don’t, we will only increase the chaos. We even risk destroying any good assets which we have, including our relationships with customers. If we are just starting our business, we are also going to need a clear understanding of which processes we will need. It does not matter how many people there are. If there are a lot of people and departments, then processes will be distributed among the departments and people. If there are not enough people, each person will need to perform more functions, and we will know what people we need based on the number and types of functions. In a startup, often one person wears many hats. So what would we do first? The processes in the first group and the third group are almost the same for different businesses. The Management processes are the activity of creating the strategy and forming the development direction, management model and principles. 8) Financial Planning and Budgeting. The main processes are the activities directly assumed by the charter company documents and forming the main product for the market/society. How would we know these main processes? The main processes depend on what kind of business you have. At the beginning we need the clear understanding your goal. After that we have to formulate the main tasks which you will want decide to reach your goal. So, we know our main processes. 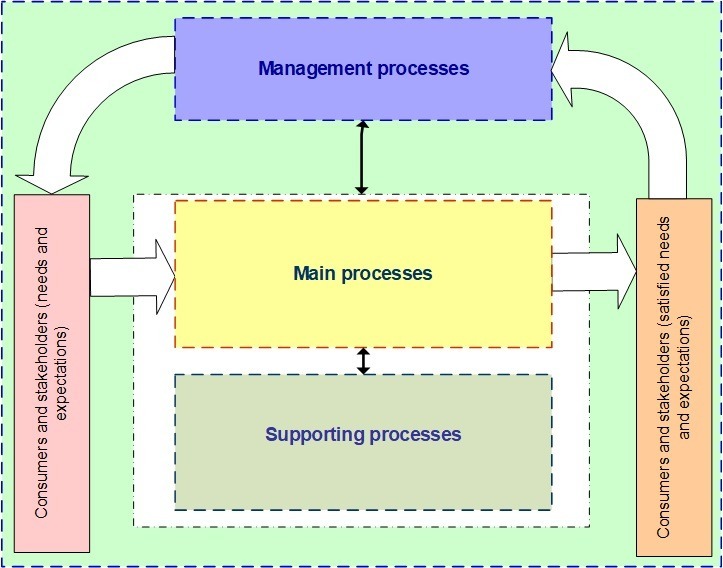 Auxiliary/supporting processes are activities, which are necessary to support the main processes, to form a single platform and typical rules of the unit and processes interaction within all other processes. When we know our processes we have to describe their inputs and outputs. Process inputs and outputs can be material, financial and information. Each business has own inputs and outputs. If we only create a company, we describe our company model. If we already have a company, we also describe the model, in this case we don't need to think about our current structure when you make description, we have to think about your goals and tasks for reaching these goals. When we will get the model we can compare our current processes and our model, we will see what we have and what we have not. After process description, we can write the plan for transfer from the current processes to the model processes. Information about the process description will be in the next article. I'll always glad to get your feed back and questions. All of you know how important and difficult the process of define and elaborate requirements for a product. Based on my experience, PMI standard and the other practices I formulated the secrets, approaches, for achieving project success. I was invited by our PMI Moscow Russian Chapter, which had begun active work in Moscow, to speak about define and elaborate requirements process (my presentation was at Business Analysis Conference, November, 7th). My lecture was in the Agency for Strategic Initiatives place in the Moscow city center. And now I’d like to share my impressions from this event. The topic had been turned a big attention not only from the project managers, but also from startups. More than 150 persons had been registered from the event. It was very interesting discussion after my presentation, and I got a great feed back, and I had interesting observation. Of course, I didn’t take the big discovery, just said about my view point and a lot of things are always known, but practically I think people don’t quite use it. Discussion after lecture was very interesting. The people told about their situations and asked how could they use these secrets? I asked for these questions and I hope it was useful for them. Some persons from startups said that it’s not about them, it’s only about classic story, about some government projects, etc. But I think it’s a very important to startups. And we talked about it too. For example, maybe some weeks ago I saw in the linkedin a post with the questions from one startups. These questions was about functions for their product. I was really surprised to see how people don’t know what to do and think only about functionality which have a lot of the same platforms. For me to know how the people are working in the different companies with different projects was very interesting and useful too, because now I know that all these secrets is important, but maybe they need more explanation and instruction how could they be used. Because of that now I’m working on the practice online course about it. New Year is coming very soon. So…it’s time for taking stocks and for new trends. I think the most important things which has been affected of all people in outgoing year were the artificial intelligence and using robots. A lot of people worry when they see how quickly these things are developing, growing up and see how they could be dangerous for people. But for my opinion we have to remember that these thing are only our technologies. Only people can decide how they will use. At this point I’d like to mention Antonio Guterres, Secretary General, United Nations, who said, that the main rules in the IT, in the using new technologies are that IT and new technologies must be safety and ethical. He said this in his speech on the Web Summit in Lisbon, November 2018, which called “Nurturing a digital future that is safe and beneficial for all”. I was there, I had listen him and it was really inspiring. And I completely agree with him. Only if people will use new technologies, including AI and robots, in this way humans will go to next level their development. A lot of people feel fear that robots could change the people, but for the now it's not possible. Just look at the example from China Xinhua News. Their experiment with the robot as a news ancor was fail, because it was not interesting to see the robot, the robot had had a voice and appearance modelled on Zhang Zhao, a real ancor with Xinhua. But a lot of people didn’t like it because there is no emotions, it was some monotonously. And yesterday I had got the “2019 PMO Predictions: 4 trends for the digital workplace” by changpoint.com. I see an interesting thing in these trends because they all concern the above problem. The first trend is “Digital disruption requires new skill set from your people…but remember, they’re only human”. It means higher demand of the soft skills. We can see it now too when people must have not only technical skills, but it’s very important to have the empathy, flexibility, communication skills, emotional intelligence, creativity, the ability to teach other people, etc. The second trend is “Digitalization requires an adaptive mindset…and a panoramic view of the landscape”. It means that to have the ability to look at the problem from above, to understand the world processes, to know new technologies, to be flexible for changing the working methods and tools, to think strategically. The third trend is “Adaptive technology is your friend…and your transformativeally”. It means that we have to enjoy these technologies and find the best using of them in our activities and agile technologies. The forth trend is “Collaboration…the blending of people skills and digital delivery”. Digital delivery will continue growing up, and it could be very useful in any businesses. We can't also deny robot and AI father development and, for my opinion we could find the ways of effectivness collaboration, it will give us a lot of benefits. It would be interesting to know your view point. Don't hesitate, leave your comment. Have a nice day and successful stories! When you think about your IT strategy, business strategy or if you think what could I propose for business, or maybe you are startup and you think what a new IT product would I create, you must know about modern trends and understand the world processes. That's why I'd like to propose for discuss my thoughts about the main trends in this year​. Our world is always in motion. There are many different trends which you are interested. I think we can find some groups of these trends. The first group is about world economy processes and trends, which is very important for international business development. There are five main types of the world economy processes, for my opinion. We can see the result of them as the same products and the same shops, the same companies in the different countries. The globalization is one of the main economy process in the world. Globalization is about the way of thinking and practice that is seen cutting across cultures and civilizations. It has changed the world picture especially in the half of the last century. World economic systems development doesn’t compromise the ability of national economies to meet or satisfy their own requirements . But today we more think about global economy, global market, global issues, and this affect entire population of the world rather than in specific country. Another one world economy process is internationalization. The internationalization theory pays attention to the border of the firm [3,4]. And in nowadays “location factors include not only “places” (the location in the city or region) but also “space”…” . Internalization is taking one country’s business across the world. Internalization is also about selling your product all over the world. Therefore, internalization retains one country's identity. The third world economy process is transnationalization, which mean transnational corporation activities. In this process there are increases transfers of capital, labor and other resources. The forth world economy process is regionalization, which mean dividing an area into smaller segments called regions. Of course, this process influences on the businesses, changing the conditions for functioning in the global political and economic system. And the last world economy process is regional/international economic integration in the world economy. The most general term by this process is the “complex process of cooptation and diffusion of national economies of various counties, aiming to create a unified economic organism” . It refers to the different regions and/or countries unions. So, in all these processes we have such trends as a multi-culture aspects of social and economic development, peaceful co-operation, continuing opening of the societies and economies  on one side. Criptocurrencies value will continues to grow and more people will invest, 2018 could be the year of regulation for blockchain and Criptocurrencies . The second group is about technologies, which grow up so rapidly. Some trends refer with blockchain and criptocurrency. So, Internet of things (IoT) may become Blockchain internet of things (BIoT), proposing new services and creating new businesses. Also financial technologies would become greener, and people will get the quantum computer, which will work at a billion times faster than today’s microprocessors . Another one technological trend is about augmented reality (AR). AR goes mainstream. The one of the real promise from AR is to bring people information they need without having to ask for it. Of course, this year is the year of bots, which will be able to provide timely information (for example, about medicine), to help with children, in financial investments and etc . We will see continuing digital centralization, artificial intelligence (AI) permeation, date overload, including reduced privacy, and possible a new generation of internet . Marketing will continue become increasingly personal, based on the people behavior, psychology, feelings, emotions. Patent analysis can give full picture about technology trends. The third group of trends is about people, how changes people’s mind and behavior in our world. The first trend is about changing of people, and the focus is less about Millenials, and more about their cohorts in Generation Z . But, for my opinion, we have also to keep in mind oldest people because they are active, have possibilities by health for work, and many of them want to work, and have a large useful experience and knowledges. The second trend is about increasing role by social networks and p2p platforms. Among the people, the interest to a cybersport is waiting to increase. One of the trend concern to project managers. Project managers will become more product managers, they will be experts who take on a leadership role within the business, fostering a culture and collaboration and trust with stakeholders . I think it also mean increase their leadership role in the project. I was part of the situations when customer had taken approval for the contract only after his meeting with the project manager, because he had need not only the project leader, but the expert too. In conclusion, I’d like to remind phrase from one of my favorite movies “The Devil wears Prada”: «Oh. I see. You think this has nothing to do with you…and you select, I don’t know, that lumpy blue sweater, for instance because you’re trying to tell the world you take yourself too seriously to care about what you put on, but what you don’t know is that sweater is not just blue. It’s not turquoise. It’s not lapis. It’s actually cerulean. And you’re also blithely unaware of the fact that in 2002, Oscar de la Renta did a collection of cerulean gowns and then it was Yves Saint Laurent who showed cerulean military jackets. Then cerulean quickly showed up in the collections of eight different designers. And then it filtered down through the department store, and then trickled on down into some tragic Casual Corner where you, no doubt, fished it out of some clearance bin. However, that blue represents millions of dollars and countless jobs. And it’s sort of comical how you think that you’ve made a choice, that exempts you from the fashion industry when, in fact, you’re wearing a sweater that was selected for you by the people in this room from a pile of “stuff”». I think these words fully reflect the process how the trends born and they become part of our life even if we do not think about them. I’d like to know your opinion about necessaries to know trends in the project/product development and successful requirements gathering. Which trends on your opinion we must know? We know that IT system development is not only about the offer of automation services based on the requirements of the customer or consumers, but it’s about development business strategy, about business development. For example, you have a shop, and when you created a web-site you have received a new market. If you are working in an international company which work with delivery shipments and you have created new technology about exchanges of shipment dates for your client, a big international company, you get a new market too, your business had gone to the next level because of the new technology. The new technology may give you possibility for work faster, with high quality and with new clients. And all of these examples about development both strategies: IT Strategy and Business strategy. So, we need successful business analysis, including requirements gathering for this process as one of the main it part. All of you know how many projects have fails, and these failures being attributed to requirements gathering, it’s almost 70% of all project failures . How could we realize the right Business Analysis (or discovered requirements) and get the set of the right requirements? It’s very important to see in the right direction (Figure). For determine problems and identify business needs we have to see around us, to find obvious things, and we have to use some set of rules. For my opinion, there are three most important set of rules. Why is it the problem? Why is this situation happen? Why do you have this process? Why any alternatives are not work? Why the solution of this problem is so important? In addition, of course, you have to remember to choose the right person as an interviewee. Planning how we could get the right requirements. Plan must include questions, on which you try to find answers (first set of rules), methods and instruments for work with them, list of sources, time, responsibilities, plan for integration, plan for quality assurance. Team work (Collaboration&Buy-In). All team member must be in the loop. You need gathering and work with all ideas no matter how crazy they can be. And you try to get support the decision from all team members. Integration Management (work with changes). It's very important when you continue working, making changes and go-back iterations. It makes your result much better and clarify requirements. Quality Management (quality assurance). When you have a mistake in the requierements, it will be cost up to 100 times in the future than it is to correct a defect early on while a requirement. Be sceptic and always ask questions with “Why”. I mean especially very useful in the result analysis the McKinsey technic called MECE (mutually exclusive, collectively exhaustive). When you think in this way, you can find your gaps in the requirements and you can prevent duplicates too. Working with hypothesis: define, generate and test them. In conclusion, to formulate the right requirements is a very complexity task, and there are a lot of information about different methods and tools. Above rules could be fundament in your requirements gathering. Business Analysis for Practitioners: A Practice Guide, Project Management Institute, 2015, p.